If you see a white or yellow spot under the tip of your toenail, it can be a fungal infection of nails commonly called toenail fungus (Onychomycosis). If left untreated, this nail fungus goes deeper into your nails and make them thick, crusty and discolored with crumbling edges. Your nails thus become unsightly and may suffer from pain too. This nail fungus is a stubborn lot and it takes quite a long time to get rid of nail fungus. Not only this, once cured this fungal infection may recur again and again. 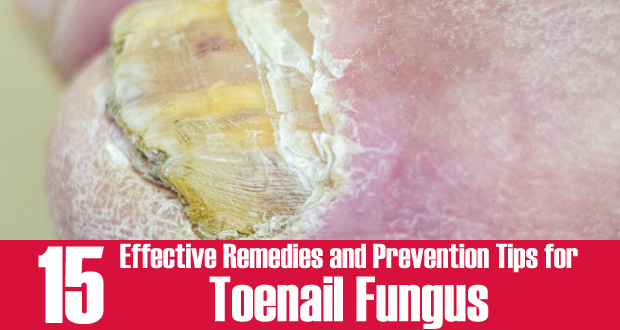 There are certain home remedies for toenail fungus that can come to your rescue. However, you should be patient with these home remedies as they may take weeks or even months to cure your nail fungus. Tea tree oil is obtained from the tree Melaleuca alternifolia of the Myrtaceae family, native to Australia. It has antimicrobial, antiseptic, antiviral, anti-bacterial, insecticide, and fungicide properties among many other. This oil is one of the best remedies for most of the viral, bacterial and fungal infections including toenail fungus. One of the causes of toenail fungus is weak immune system and because tea tree oil is an immune system stimulant too, it can even cure those nail fungus that are most difficult to do away with. Paint tea tree oil on your fungus affected nails twice a day. Do this for at least 2-3 months. Pour a few drops of tea tree oil on a cotton ball and place this on your nail with fungus. Leave this overnight. You may use a tape to hold the cotton in place. Simply apply 1-2 drops of tea tree oil to your toenail 2-3 times a day. Oregano herb, the pleasantly smelling culinary delight, can also get you rid of fungal infections like Candida, athlete’s foot and toenail fungus. This oil is one of the best natural anti-bacterial and anti-fungal agent. The component of this oil, carvacrol, is the germicide agent that eliminates fungi and bacteria. After washing and drying your feet properly, take oregano oil drops in a cotton ball. Apply this to your fungus affected nail. You can also directly pour the oil over nail but try not to use too much. 2-3 drops is only what you need for treating fungus. If the undiluted oil feels strong or you experience redness or itching, dilute the oil in your carrier oil and then apply this to your toenail fungus. You may need to continue doing this for 2-3 months or till you don’t grow a new nail on your toe. If you suffer from recurring toenail fungus due to compromised immunity, you may also take it internally. For this, add 2-3 drops of oregano oil in a glass of water and have it twice daily. This will help strengthen your immune system. In a study conducted back in 1990, the researchers found that grapefruit seed extract as effective and sometimes even better than 30 antibiotics and 18 fungicides. This makes this natural extract derived from the seeds and pulp of very nutritious grapefruit suitable to cure a wide variety of fungal infections. It can be applied topically as well as taken internally. When taken internally, it cures yeast infections, thrush, candidiasis, nail infections and athlete’s foot. Take a few drops of grapefruit seed extract and apply this to your nail fungus 2-3 times a day. Add 10 drops of grapefruit seed extract in a cup of water and have this three times a day. In folk remedies, garlic has always found a significant place due to its health benefits. Modern studies have further proved the excellent anti-bacterial and anti-fungal properties of garlic. There is this compound in garlic called ajoene which is a strong anti-fungal agent. This ajoene is actually formed by the combination of the compound allicin and the enzyme allinase, both present in raw garlic. When you crush or mash a raw garlic clove, these two components allicin and allinase come into contact and form ajoene. Garlic cloves- 1 each for every affected toe nail. Before applying garlic, if you apply warm and moist heat to your fungus affected nails, it will bring the fungus up towards the surface so that you get rid of all of them. Warm and moist environments always attract fungus. Soak the washcloth or cotton ball in warm water, wring out the excess water and place this on your toenail. Crush a clove of garlic and place this on a cotton gauze and cover this with another cotton gauze so that the garlic clove gets sandwiched in between two gauze. Place this gauze with garlic on your fungus affected nail and use a bandage or tape to hold it in place. Replace this dressing after every 3-5 hours. Discard the used garlic and use fresh garlic in a fresh gauze every time. Apart from applying garlic to your toenail, eat 1-2 raw garlic cloves daily. This will eliminate fungus completely from your body and also prevent them from thriving and recurring. Hippocrates, the father of modern medicine, used vinegar as early as 400 BC to treat infections. Modern researches too have confirmed the anti-microbial properties of vinegar. However, this is in regard of vinegar’s properties as food preservatives. Although there are no strong scientific researches supporting the claim of traditional remedies favoring vinegar as an effective remedy for infections, many people who have used it to treat their nail fungus had been successful in eliminating the infection. This may be due to the natural acids present in vinegar. Mix one part of vinegar with 3 parts of water. After soaking, rinse your feet with water. Dry tour toe nails completely as warm moist environment is a thriving ground for fungus. Soak your nails in vinegar water solution everyday till your infection is eliminated completely. If you find vinegar a bit too stronger, use apple cider vinegar which is our next remedy for toenail fungus. Fungal infection leads to imbalance in the pH levels of the surrounding skin of your toenails. It becomes more alkaline where the fungus get a chance to survive and thrive. Apple cider vinegar makes this environment more acidic and thus hostile for fungus. This vinegar is also not very strong and has mild effect on your skin. Prepare a footbath using one part of apple cider vinegar and one part of water. Ensure to fill the basin enough to soak your toenails. Rinse with water and dry your toenails completely. Repeat this 1-3 times a day till you get rid of fungus. Take 2-3 drops of apple cider vinegar. Apply this directly to your nail bed. Let this sit there for a couple of minutes. Now spread it all over your nail. You may need to do this for 2-3 months or till you get a complete new nail on your toe. You can take advantage of various anti-fungal agents at once by using them together. This will also ensure that you get rid of fungus on your nails completely and forever. This herbal solution uses certain oils along with vinegar and pau d’arco tincture. Pau D’Arco or Lapacho is a herb with strong anti-fungal agents in it. Mix all the ingredients- vinegar, essential oils, and the tincture. Soak the cloth or gauze in this herbal solution. Take out the cloth and apply this to your fungus affected toenail. Let it stay there for about 10-15 minutes. Lemon juice is a natural anti-septic and anti-fungal agent. Its acidic properties help balance the pH levels of the body or the skin where it is applied so that the fungus cannot thrive there. To be particular, the citric acid in lemon juice helps eliminate toenail fungus from flourishing and spreading. Apply lemon juice directly on your toenail and let it sit there for about 15 minutes. Rinse your feet with warm water and dry the toenails completely. Take a cotton ball and pour some lemon juice on it. Place this cotton ball on your toenail and with the help of a tape, secure it there. Remove this after 15 minutes, rinse with warm water and then dry the nails completely. If you find the pure lemon juice too acidic or strong having drying effect on your surrounding skin, you may dilute it with some olive oil. Massage your toenails with this mixture. You need to apply lemon juice 2-3 times a day until you get rid of your toenail fungus. Baking soda again helps maintain pH levels of the skin around nails. Baking Soda or the Sodium Bicarbonate is obtained from a natural occurring mineral. It is very mild on skin and has wonderful effect on fungal infections. Mix some baking soda with warm water to make a paste. Apply this paste to the fungus affected toenails. Let it sit there for few minutes and rinse with with water removing all the soda from there. Completely dry the toenails. Take 1-2 tsp of baking soda and equal amount of arrowroot powder. Add 1-2 drops each of tea tree oil, basil oil, and sage oil to this. Apply this powder to your toes before wearing socks and shoes. This will prevent as well as cure any fungal infection. Take ½ cup each of baking soda and Epsom salt. Ix them with 4 cups of hot water. Add ¼ cup of vinegar to this. Soak your toenails in this solution for few minutes each day. You may also soak a cotton ball in this solution and hold this between your toes and on nails for few minutes twice a day. Coconut oil has been traditionally used for treating various skin conditions including nail fungus. Modern researches have now found its medium chain fatty acids responsible for fungicide properties of coconut oil. From among these fatty acids, caprylic acid is considered to be the one which eliminates fungi by penetrating into the membranes of the fungus. This caprylic acid diffuses into the cell membrane of fungi and leads to cell disintegration which ultimately kills the fungus. Take some coconut oil and rub this on your fungus affected toenails. Turmeric has been used in India and China for its medicinal properties since ages. It has this compound called curcumin which grants this spice herb its anti-fungal and anti-bacterial properties. Turmeric oil also has effective function against yeast and fungus. Many studies have shown that pathogenic fungi growth can be inhibited by turmeric oil. How to Use Turmeric for Toenail Fungus? Add some water to the turmeric powder to make a paste. Apply this to the affected toenails. Wash off with water. You may also use warm water as turmeric stains and it needs a little effort to remove the stains form skin. Take care as turmeric may stain your clothes too. Repeat this thrice a day. You should also drink a glass of milk with a teaspoon of turmeric powder added to it daily. This heals any fungal or yeast infection inside the body. It also strengthens your immunity. Olive leaf extract has strong anti-microbial properties that can cure your nail fungus effectively. Olive tree (Olea europaea) has this active ingredient called Oleuropein present in all its parts. Oleuropein possesses strong anti-fungal, anti-viral, anti-bacterial and anti-parasitic properties. A Dutch study found that oleuropein inhibits the growth of viruses, bacteria, fungi and parasites. It interferes with the production of amino acid for viruses and probably has the ability to directly penetrate the infected cells and stop viral replication. How to Use Olive Leaf Extract? Apply pure olive leaf extract directly on the fungus affected toenails. Repeat 2-3 times a day. Mix 1 tsp of olive leaf extract with fruit juice or any other food and have it thrice a day. You should always have it after meals. If taken on empty stomach, it may lead to nausea. Consult your doctor before taking any herbal solution or medicine, especially if you are pregnant or breastfeeding mother or are on medication for heart, diabetes or any other serious disease. Clove oil has known antifungal, anesthetic and antiseptic properties. This is due to eugenol, also found in oregano oil and which has been proved in laboratory tests to have excellent antifungal properties. Clove oil is 60 – 90 percent eugenol, which is the source of its antifungal, anesthetic and antiseptic properties. This remedy is perfect for you if you also have pain due to your toenail fungus because clove oil has capsaicin which can cure your pain. Capsaicin is the same active ingredient which is also found in cayenne pepper. Apply clove oil directly on your affected toenails. If your skin around nails is broken or you have sensitive skin, dilute the oil by mixing it with olive or coconut oil. Cinnamon oil, yet again, is a strong anti-fungal oil just like clove oil. This is again due to the presence of eugenol which has effective action against fungus. Cinnamon has been proved highly effective against Candida yeast infection which is also one of the causes of toenail fungus. What is important is that you can topically apply cinnamon oil to cure your toe nail fungus and also have it internally in the form of cinnamon tea to treat your overall yeast infection. Whenever you apply any oil or other ingredient on your toenails for treating fungal infection, you should clean the area properly. If the nails have thickened, cut and file them properly. If you have broken skin or sensitive skin, dilute cinnamon oil with water. Use 1-2 drops of this oil in 1 tsp of water. You may also dilute it with some carrier oil like olive or coconut oil. If you can tolerate the sting of the undiluted cinnamon oil, apply it directly without mixing it with water. Use a cotton ball to apply diluted or undiluted oil to your affected nails. Add 1-2 tsp of cinnamon oil in a basin full of hot water. If you wish, you can also add some sea salt to this but this is entirely optional. After soaking, dry your feet and nails completely. Place black tea, cinnamon stick or powder, whatever you are using in a pot. Strain if required and add honey if using. Most of the times, wrong habits of wearing shoes and not taking proper care of feet leads to toenail fungus. Here are some tips for you to prevent toenail fungus. Moist socks and shoes are breeding ground for fungus. Let air reach your feet to prevent warm and moist environment. If prone to nail fungus, you may wear open sandals in place of shoes. Wash your socks after every use and wash them in hot water. Sprinkle baking soda inside your socks and toe nails when wearing closed shoes. Whenever your feet get wet, dry them thoroughly. Taking proper care of your feet can save you from all the discomforts of toenail fungus.